Frank says, “…until I saw all of the stories together, I didn’t realize how much the places I have lived have influenced where I set particular narratives. When I lived in Fresno, I was teaching at Cal State and visiting advertising clients in the San Joaquin Valley and Los Angeles. Although not specifically identified, the storyAccident With a View unfolds in the hills of Los Angeles, and the main character reveals a former life in Fresno, which shaped who he has become. But recently that voice vanished, replaced by a younger-sounding female. Yes, she is pleasant to listen to — but what happened to our longtime friend on the airwaves? ''This is where I do my recording,'' he said, opening a tiny closet in his home in Hamden lined with hangers of coats and shirts, shelves filled with sweaters and several stacked suitcases. At the end of the closet: a chair, a little table and a microphone. Tavares' understanding neighbor, Jim Fracasse, learned to understand Tavares' set schedule: 8 a.m. to about noon, every other Saturday. That's when Tavares went into his closet and recorded hundreds of funding credits that were heard all over the world. ''I'll do around 600 of them every other week,'' Tavares said. NPR officials wanted to combine Tavares' part-time job with that of another employee, so one person would do the voice work as well as handling the recording and editing. Because Tavares has established a nice life in Connecticut and has that full-time day job at SCSU and doesn't want to uproot his wife and their two sons, he never considered applying. His short stories have appeared in assorted literary journals. He recently had published a collection of them, ''The Man Who Built Boxes.'' He also is working on a novel. He was reminded of those words when he arrived at Wheaton College in Illinois in 1962 and saw a sign-up table for the college radio station. That work led to jobs with commercial stations after he graduated. In 1972, he landed his first job with public radio, in Austin, Texas. And in 1978, he was hired to work at NPR in Washington, helping direct audience programming. Tavares said he got ''burned out'' from the 80-hour workweeks and in 1989 accepted an offer to teach at SCSU. But he continued to do the NPR voice work. If you’re an NPR listener, then you already know Frank Tavares. 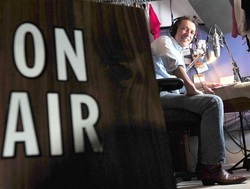 For many years, he’s been called “The Most Heard Voice” on public radio. Listeners across the country have heard him dozens of times a day as the man who says, "Support for NPR comes from NPR member stations and . . . .", announcing the funding credits after every national news and information program. 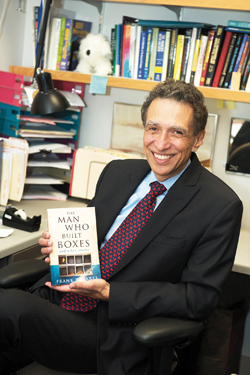 His new book, The Man Who Built Boxes showcases his unique and masterful story-telling abilities with twelve stories, and a remarkable cast of complex, quirky characters tangled up in the limits they’ve put on their lives. Cliff Wayland longs for any sign of affection from his wife, Brooke, even though she’s told him that part of their life together is over. What she hasn’t told him is how she spends her evenings when he’s out of town and just where she sees the marriage heading. Put two Iraq war veterans like Newt Snyder and Frank Brevic, still scarred from their service, next door to each other and a friendly feud between neighbors quickly escalates into something that could turn deadly. Jimmy Mendoza hated Tamale Jones, even though he’d continued to work with him for years. Jimmy couldn’t help being pleased when Tamale drops dead like a stone into his pasta. Jimmy goes to the funeral looking for closure, but even in death Tamale manages to take away Jimmy’s last hope for his big chance. Antonio Enzo Marino, aka Eddie Enzo, lives in a small Italian village. His house is on a hill that is gradually crumbling--his yard is getting smaller each year. But despite 20 years in Italy and his long marriage to Adelina, he has never forgotten the girl he left behind in Texas. Following Adelina’s death, after the garden she had planted and tended falls away, he feels freed to revisit his old love. “Frank is as enjoyable to read as he is to listen to”. - Tom Bodett, author, blogger, and panelist on NPR's Wait, Wait . . . Don't Tell Me! - Jack B. Bedell, author of Bone-Hollow, True: New & Selected Poems and director of Louisiana Literature Press. "Frank Tavares really is a terrific storyteller; like someone surrounded by folks at a party or the person sitting next to you on an airplane who keeps you totally enthralled during the entire flight. In many ways, you probably know the people and situations he writes about. Indeed, you may even find parts of yourself among them. Even so, they are bound to surprise you; which makes it so enjoyable to read about them." Frank Tavares has been writing his entire professional life. He started publishing fiction 10 years ago and his short stories have appeared in a variety of literary journals including Louisiana Literature, Connecticut Review, Story Quarterly, and The GW Review. He is a professor of communication at Southern Connecticut State University. He is also one of the founding editors and active member of the editorial board of The Journal of Radio and Audio Media. NPR listeners still hear his voice as the signature to all network news programs—"Support for NPR comes from NPR member stations and . . . ."
Dr. Frank Tavares (Professor) has a B.A. in English literature from Wheaton College in Wheaton, Ill., an M.A. in theater from Northern Illinois University, and a Ph.D. in communication from the University of Texas at Austin. He has also taught at California State University in Fresno; the University of Maryland at College Park; Rockford College in Rockford, Ill.; and Marymount University in Arlington, Va. He presently lives in Connecticut.